Lovely and serene beach tablescape, created with a Seaglass Blue Striped Table Runner, Dinnerware Set in Light Blue, Fish Plates, Rattan Chargers, Coral Napkin Rings, Jute Net Glass Lantern filled with sand and shells, Seashell Placecard Holders, as well as small decorative shells and grasses reminiscent of sea grass and sea oats. 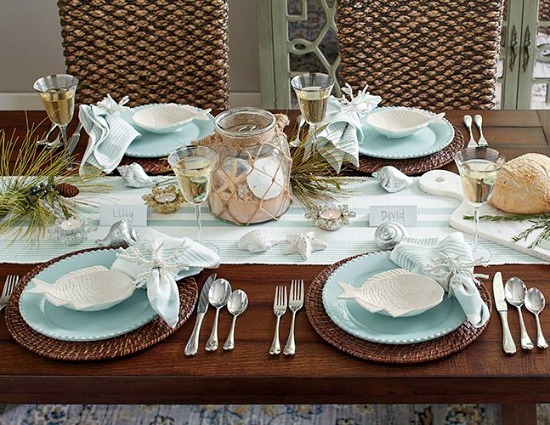 The festive flair of this light blue beach tabletop makes this idea suitable for any occasion. Some featured beach decor items might no longer be available. If that's the case, I hope that you will find something similar from Birch Lane or in one of these Favorite Stores.